A lack of conviction is not an accusation which can fairly be levelled at Kim Stanley Robinson's Galileo's Dream , however. It is clearly a labour of love, since every page of this thick novel is suffused with a passion for its subject matter: Galileo Galilei, the man, of course, who upheld Copernican physics and held fast against the persecution of the Church. 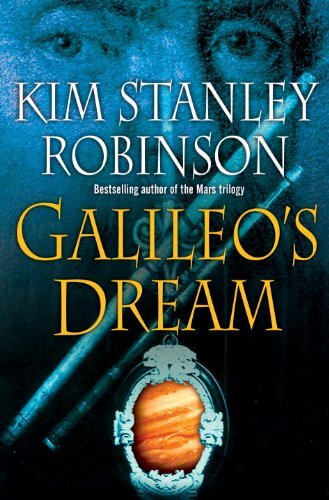 This is not to say that Robinson's Galileo is an airbrushed hero: he is irascible and arrogant, abandons his daughter to a nunnery, and treats many around him with only a functional interest. This Galileo's only real love, the only thing which inspires his humanity, is the pursuit and acquisition of knowledge. "I'm going to cut the Gordian knot," he declares without irony. "I'm going to cut the world in two" (p. 21). And so begins a survey of Galileo's career, from his invention of the first telescope to his death in irritable old age. From the off, too, however, there is also a shadow story quite at odds with the historical fiction form that summary may suggest. In the very first line we are alerted to the fluidity of time as Galileo experiences déjà vu, and shortly thereafter we are introduced to a stranger who initially claims to hail from Portugal, and who gifts Galileo with clues enough to construct that first looking glass. The stranger is in truth a man named Ganymede, travelling to Renaissance Venice from the thirty-second century moons of Jupiter. He is doing so, we soon learn, to ensure that Galileo is burned by the Pope for heresy. As John Clute has noted in these very pages, one of the smartest elements of Galileo's Dream is the manner in which it slips and slides between timeframes. In our reality, of course, Galileo was not burned; in Ganymede's he was. Upon our first glimpse of Ganymede, we assume his present is our future, but that is not the way it works. It remains in flux. Consequently, each time Galileo is taken forwards in time, the future is kept a tantalising distance from our full understanding. Robinson achieves this by clever use of Galileo's point of view, which, though expansive and hugely flexible (with the help of a learning drug, he soon comes to understand the vast sweep of scientific progress made between his death and the human colonisation of the stars), is also a product of his own culture: his view of women is dismissive, and he continually perceives the future in terms of his past. (Interstellar parliaments behave to his eyes "like rival gangs in a piazza" [p. 55].) 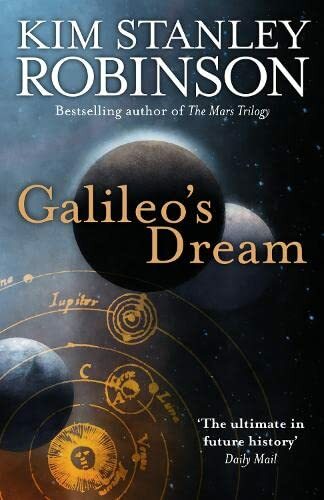 By refusing to give us a complete vision of the future, Robinson underlines its contingent status: Galileo experiences his life as it happens, and each event causes innumerable eddies in the timestream. The future cannot be known; Robinson's vision of time—one of ten dimensions of which 32nd century humans are aware—is too subtle for that. This gambit does, though, cause some frustration. The future sections of the novel, about a third of it, are already populated by cold environments and colder characters—migration into the void, and loss on planet Earth, have made humans harder and more fatalistic. But, coupled with this enforced obscurantism, the science fictional sections begin to appear flat and even info-dumpy. Some of Robinson's handwaves are suspiciously convenient—most notably, the energy-dependent reasons that Ganymede cannot check on Galileo's progress by travelling forward in time as well as backwards—and others are only barely convincing (the efforts of the scientist Bao to overcome the challenges of an impossibly complex quantum physics, for instance, are naturally—inevitably—speculative). They involve a lot of conversations with people from the future in which Galileo has concepts explained to him. Without also the colourful context of a fully realised future world, this risks feeling to the reader like sadly necessary filler. Thematically, however, it works perfectly. Galileo's Dream is thoroughly, consistently quantum: "the world hasn't made sense since 1927," one character tells Galileo (p. 277). This considered approach is almost ruthlessly applied. It would be a less honest, a less rigorous book, which did not carry out its project, even at the expense of its accessibility. The novel is the strange story of how its protagonist's revolutionary—transformative—commitment to observation set in motion a chain of observations which would ultimately render reality unobservable and counter-intuitive. "That the Earth's water moves because space itself is bending—it's inexcusable," Galileo objects at one point. "And yet real," he is reminded (p. 362). Observation trumps assumption, even when the assumption makes more sense. It is in this unity that the greatness of Galileo's Dream is found. It is not, as it has sometimes been argued, two inexpertly mating novels—one historical fiction, the other science fiction. It is a quantum narrative, each strut of which supports the other, offering a particular counterpoint to the approach of Yellow Blue Tibia . Its Galileo is a whole person rendered on the page, and he holds the whole affair together with humanity and energy; the narrative voice is tricksy and fluid, and for a long time the reader remains uncertain if it is told in a single or multiple voice (and if single to whom that voice belongs); the historical sections deal with human interaction and scientific process with subtlety and troubled affection; the whole enterprise is directed towards a great purpose, an impassioned argument for the benefit of careful observation, of collective scientific endeavour. It is at times alienating, it may also at times be over-long or clumsily written (historical characters intermittently demotic, reasoned arguments occasionally preachy); but it is an important, fiercely coherent, and profound work of science fiction. Spirit , however, is much more what one might expect of a science fictional future. Gwyneth Jones's latest novel is set on a future Earth, following independence from an indeterminate period of time under alien rule. The human race, factional despite being governed by a near-global empire with its centre in China and central Asia, is taking its first tentative steps into an interstellar congress of intelligent species. 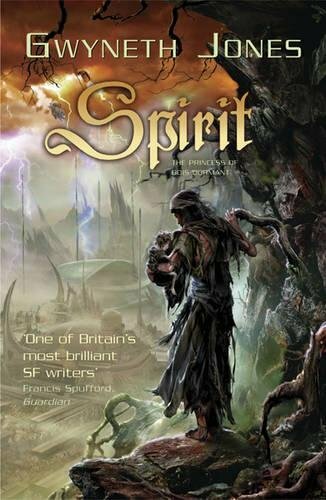 If all this sounds familiar, it may be because Spirit is not at all a standalone novel, but is informed by both the author's Aleutian trilogy, the story of that alien colonisation, and her Bold as Love quintet, which details the development of the mind/matter technology used in Spirit to effect interstellar travel. Jones has commented: "When I came to write the Buonarotti book, after having done a little suite of Buonarotti stories to get myself into the frame, I decided that hell, I've got this backstory, I'll use it. Nobody who hasn't read the Aleutian books or the Bold as Love books will even notice" ( Vector 260, p. 21, 2009). Alas, this optimism is not quite justified. Spirit is my first Jones, and I admit to feeling lost; I am remiss even in reading a few of the Aleutian short stories, which many believe provide context enough to enjoy the current novel. Even given this context (in fact I discovered whilst reading the novel that the stories are online, as indeed on the same page is Spirit itself), it might still be the case that I would find Spirit defiantly opaque in its worldbuilding; but I can't shake the sense that Jones has in fact underestimated the accumulated weight of her combined mythologies. When characters discuss the shared history of their worlds, they do so as real people will—with elision and reference, rather than explicit capitulation—and this deserves some credit, given the reservations some have had of Robinson's tendency to lecture. But the book rests on so much which has come before that this gambit forces the reader to work harder on understanding the world than the story. Perhaps this is Jones's purpose. Her story is often lost under the pressure of context, but this is in many ways the experience of its main character. Bibi, the sole survivor of the imperial conquest of a rebel stronghold in Cymru, becomes the servant of Lady Nef, wife to the victorious General Yu. She is thus admitted to the glittering world of Great Houses which sits at the apex of an otherwise impoverished and semi-feudal world. This world also contains the products of alien occupation and interstellar contact—starships and starports, great futuristic constructions and resident aliens. It is a heady world into which Bibi steps, and its pressures and confusions repeatedly threaten to collapse around her; she is sure such a collapse would kill her. Elision remains a key technique of Jones's. Early on, Bibi leaves her Great House for six years and we simply return with her after this time to a myriad barely explained changes; later, when an ambassadorial party to which she is attached—and which is led by a disgraced General Yu, interstellar exile his only hope of surviving a change in political fortune—undergoes complete and engineered collapse and destruction, she is consigned to a prison cell in which she spends years, giving birth to the child of an alien prince and, with it, the remnants of an alien friend. When she returns to her world as a glittering princess intent on revenge, we once again go with her; and, once again, all has changed. The world of Spirit is in constant, maddening flux, and we feel the strain along with Bibi. For those who begin to find the story ever more familiar, that prison cell and that aristocratic, vengeful return are indeed taken from Alexandre Dumas's rollicking The Count of Monte Cristo (1844-46); Bibi is indeed gifted her identity once more by an ancient and wise fellow prisoner (Lady Nef, also survived) and she does indeed return to a hollowed-out, fin de siècle society full of pomp and poverty. Dumas's novel is a cornerstone of Western literature, its central images long since filtered into the cultural consciousness; famously, too, Alfred Bester has already turned the tale into science fiction in the still-superlative The Stars My Destination (1956). Jones's contribution to this tradition is to replace the male protagonist with a female one. Whether in its depiction of concubinage or Lady Macbeth politicking, a key theme of Spirit is the nature of female power; through its aliens and its stratified society, its analysis of the process of othering is also prominent. This Count of Monte Cristo—Bibi becomes the Princess of Bois Dormant—is refreshingly interested in suppressed voices and multiple approaches. It is not—in its worldbuilding, odd pregnancies, or unknowable extraterrestrials—normative or normalising. The egalitarian ideals of the French Revolution, with which Dumas originally played, are happily emphasised here in the battle not just between the planet's Traditionalists and Reformers, but in the personal battles of each of its marginalised or deprivileged characters. The stodgy indigestibility of Spirit 's world, however, infects its treatment of the parent work. Dumas was an excitingly episodic writer, a technique forced upon him by serialisation but which he made core to his brand; The Count of Monte Cristo in particular also derives much of its pleasure from its dizzying, but uniquely drawn, cast of characters. It is a technique he also deployed to similar effect in The Vicomte of Bragelonne (1847-50), in which a huge number of competing characters make for a vibrant, multi-faceted plot. Jones, however, is—as Nic Clarke observed in her review for SFX magazine—at her best when it comes to interiority, to the downbeat rather than the colourful. Spirit has neither the episodic momentum of Dumas, nor his facility for the bustling narrative. It thus reads, regardless of the perhaps deliberate mirroring of Bibi's own experience, slowly and ponderously. Again, I may lack the context; but content is what wins you awards. 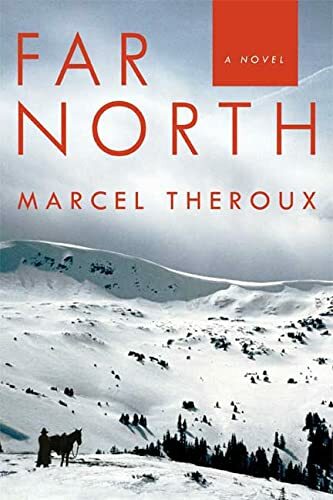 The final shortlisted volume, Marcel Theroux's Far North , is far fleeter of foot. This may be no surprise—it is this year's literary entry, published by Faber & Faber with all that suggests about the prioritising of literary style. And certainly Far North is a beautifully written book. I have already reviewed it for Strange Horizons , and in that review I wrote that Theroux is "some way ahead of many other writers in crafting a novel which works its sometimes strong, sometimes weak, sometimes competing threads lightly and decoratively." Upon re-read—and we should remember that the Clarke judges will read each of these shortlisted books at least twice—the sweetness of the prose struck me all the more. Theroux has written a perfectly voiced novel, in which diction and dialect ally with poetry and poise not just to tell a story but to reflect it back upon itself. It is also a novel with a clear-sighted vision of a human future. "Goodness only lives when the times permit it," the novel's narrator, Makepeace, intones at one juncture (p. 74). The novel is set in a "broken age" (p. 15), in which what was best about humanity—its creativity, its interconnectedness, its compassion—have been put aside in favour of the simple, brute business of survival. "It takes a quick and ruthless type to flourish amid disorder," Makepeace shrugs (p. 110); cities and neighbourliness have gone the way of the dinosaur, as might eventually humanity itself: "we would be lucky to be this boy, stalking poisoned animals in a forest we could no longer name. He was our best possible future" (p. 184). Amidst this bleakness, what is astonishing is Theroux's refusal to pretend human beings are incapable of nobility and goodness, even to strive for it. We are hubristic, for sure, and the complicated societies we have constructed around ourselves are uniquely vulnerable to even the slightest shift beneath our feet. But the things we have accomplished are all that Makepeace hopes might be again, and the father who hangs over the narrative, who moved to the Far North in rejection of those complicated luxurious societies, is dismissed as a deluded fool: why not grab anything which can make life easier? This is the only revelation Makepeace's world allows. This hard-bitten Western philosophy is wrinkled by Theroux's bold sleight of hand in revealing, a short way into the novel, that Makepeace is a woman. It is a gleeful reveal which should offend the reader, but such is Theroux's control of Makepeace's voice, so total is in his conception of her as a character and a person that this and other awkward junctures—when her city's only other inhabitant, in whom we have invested a great deal of emotion, suddenly dies and is buried with her unborn child in a matter of three lines, or when we are repeatedly teased about some awful truth from Makepeace's past—are managed beautifully and with coherence and integrity. Where Wooding's characters have histories he dangles before us in order to keep us reading, or Jones's elisions strike us as clumsy or difficult, Theroux's control and finesse come to his aid. This is not to say Far North is a startlingly original science fiction novel. As I wrote in my original review, it draws liberally on its antecedents, on the pragmatic realism of the Western, the apocalyptic bleakness of McCarthy's The Road (2006), and even, in the case of Tarkovsky's Stalker (1979), the very name and concept of a key plot point, The Zone; its future is explained only partially and with a deliberate hesitancy about finally ascribing it to climate change; and the woman-wronged personal trauma in Makepeace's past might be given the hoariest treatment in the whole novel (though it stops happily short of rendering Makepeace a simple victim, or of creating an irredeemable villain in Eben, her antagonist). Theroux's writing and his characterisation, however, ultimately make something whole and convincing of these disparate parts. His Far North , all displaced societies and nomadic indigenes, is a comprehensive future, a memorable and plausible vision, even if the connective tissue between it and us is hazily drawn. If, for a novel with a cross-dressing protagonist, it is not as subversive on gender as it might be, it also does not hide man's inhumanity to woman. Far North is a serious, considered work; it is no game-playing pastiche, nor an impolite science fictional foray by a clueless literary writer. It finds its fascination in the joins. "It's a kind of heresy to say so," Makepeace reflects, "but I think our race has made forms more beautiful than what was here before us. Sometimes god's handiwork is crude" (p. 246). There is in Theroux's pessimistic vision of human nature a contravening hope for its better angels; it holds out an expectation that Makepeace's world is not inevitable for our grandchildren. It is, though, a warning that we will always find it easier to knife our neighbour in his sleep than help him tend his crop. This emphasis on the importance of collective endeavour may remind you of Galileo's Dream . This would be fortunate, given that it is that novel, along with Far North , which I consider the best of these six. The two books, though very different in style and even purpose, both offer comprehensive, cohesive visions which are brought together by considered writing and serious craft. The City & The City , perhaps, has these things, too, and probably remains the favourite; but unlike Robinson and Theroux, Miéville cannot quite stretch the canvas over his frame. You can see the joins in all three novels, but the quality of what you find there differs. I find it difficult to choose between the final two, however. Even as I write I waver. They are in many ways chalk and cheese—a genre favourite writing an enthusiastic paean to science and the science fictional, and a literary interloper refashioning tropes into a beautiful artefact. The former makes for a messy work, the latter for a less ambitious one. For its quality of writing and memorable vision, however, Far North may edge it for me: there is no fat on its bones, and yet plenty of meat. The admittedly flabbier Galileo's Dream , though, would also be a worthy winner—exciting, impassioned, and thoroughly realised. Award shortlists are primarily useful not as barometer, record, or pulse-taker, but as a discussion piece, like an outré object at a dinner party. They should spark interest and debate about the works considered and perhaps—perhaps—their relation to the field in which they move, nothing more. The ultimate winner is less important than the pre-match analysis. Ignore the state-of-the-genre posturing; what did you think of the books? I agree about the quality of writing and the memorable vision - the whole section concerning the first visit to the zone is very good. And I enjoyed the book and the central character is very engaging ... BUT: I don't buy the scenario. 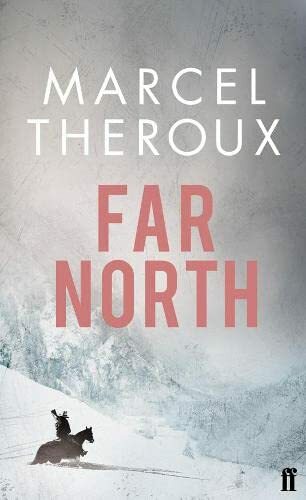 This is a novel with some disparate locations, linked by a road (the plot thread) but one has the impression that if one walked a couple of paces away from the road/plot, there would only be blank empty space (Theroux's use of snow indicates perhaps a metafictional awareness of this although no one seems to be reading it this way and it is clearly not metafictional in the sense that Adam Roberts's The Snow is). The elaborate structure of the slave farm doesn't make sense. The text, itself, acknowledges that free farmers would produce more food than the slaves - so frankly that whole structure is ahistorical and asociological. Ok, Theroux tries to get us to buy that this weird structure is set up to support the trips to the zone - but it would be much more effcient to send in people who really knew what they wanted in suits. There is no reasoned underpinning of what is going on in the book and that is what it loses in comparison to the four well-established genre authors on the list (and even Retribution Falls has a much more coherent and believable society). I suppose in genre terms, what Far north lacks is credible world-building. This is a feature of some 'literary' sf - for example, Gilead in Handmaid's tale is another society that you just can't see functioning - it has no economic, sociological or intellectual basis from which to come into being. One can place Far North in that North American disaster tradition form Earth Abides (which is a beautiful book) on through recent examples by Atwood and McCarthy. Something ill-defined happens and society immediately falls apart. Whereas in the British tradition, something better-defined happens and society adjusts and new formations come into being which have economic and sociological justifications. Basically, the American tradition represents a highly ideological and reactionary rejection of the notion of society itself. And as such I think it is fundamentally anti-science fictional. So, I enjoyed the book, enjoyed the writing, liked the character, but for me it shouldn't be on the short list let alone considered a potential winner. please Read science fiction Novels(Arther c.clarke Novels&short list of Arther c.clarke Award Novels(from 20 years));please send your Response to me; THANK U! ; .